9. Think in the present and get on with it, keep experimenting! 10. Die a happy death. Morbid thought, but a powerful motivator to take action now! The way you think governs the way you behave and act. Beware of what you are thinking about. The ability to master the mind is what differentiates ‘winners’ from ‘runners up’. The real entrepreneurial stars are the ones who manage to consistently switch into their higher state when needed – I would describe this state as being one were individuals view both opportunity and challenge within a positive and courageous mental framework. The scaling of companies is a topic I have been interested in for some years. More specifically why don’t more entrepreneurs go for more ambitious growth? A scale up company is defined as one that grows its employee or turnover at a rate of 20 per cent per annum over a three-year period. Taking entrepreneurs to Silicon Valley the home of scale ups, motivating founders to raise the bar through coaching and creating communities of like-minded business people have all featured in my quest to create more of them. My experience tells me that those who decide to have a go recognise there are two principle costs to growth. These costs are presented in two forms. Firstly, the emotional cost to the individuals involved, this usually manifests in self imposed pressure and the uncertainty that demands resilience and mental toughness to keep going when the inevitable road blocks are presented. 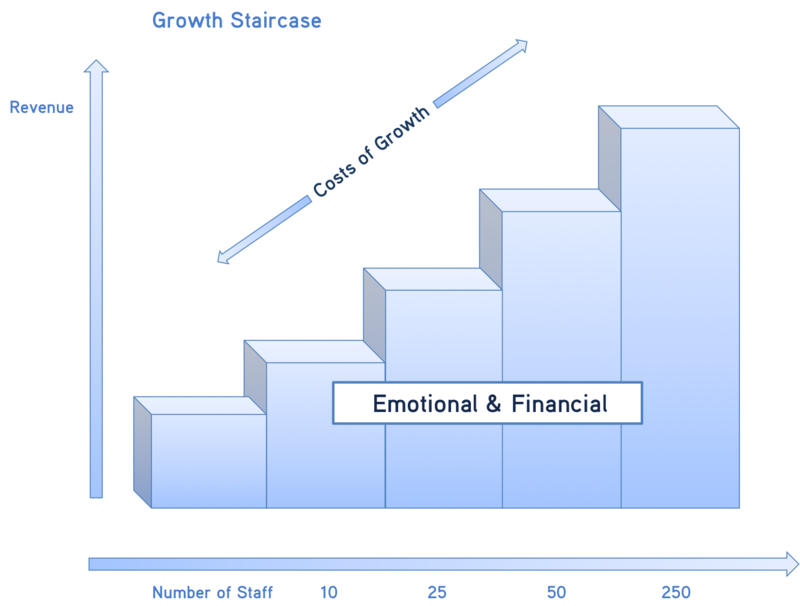 Coming to terms with the two principle costs of growth is the very reason why the majority of the 500,000 of last year’s new start up’s will never go on to employ one person never mind 10. It’s also why over 99% of UK firms employ less than 50 people. Busting through the natural ceilings of growth requires entrepreneurs to pass the alignment test – once head, heart and wallet are in sync then growth can at least have the chance to happen. Without it, business as usual prevails. So often it’s the financial cost of growth that holds individuals back – once you can get over it in your mind and accept the facts, only then can you move on. This is a hiatus that many entrepreneurs reach – very few get through it. The UK needs more companies of scale; it’s these businesses that bring about the added value to the economy – innovation, graduate jobs, links to HE and hopefully international trade. Lets give ambitious individuals the trusted advice they deserve. It’s only with a good team around you that you can move forward in an aligned fashion.